Sound familiar? Both my girls protested wearing sunscreen. They wanted to hit the beach and I was just slowing them down. It’s a bit easier now that they are older. Olivia is turning 18 in July and applies it without any coaxing from me. Bridget, age 11, still needs reminders though it has gotten easier with her! I’ve partnered with Banana Boat over the next month as a Banana Boat ambassador. I’ll be sharing some mom hacks to help you get your kids to wear sunscreen. These are tips that have worked with my own two daughters and hopefully will help you as well with your children. 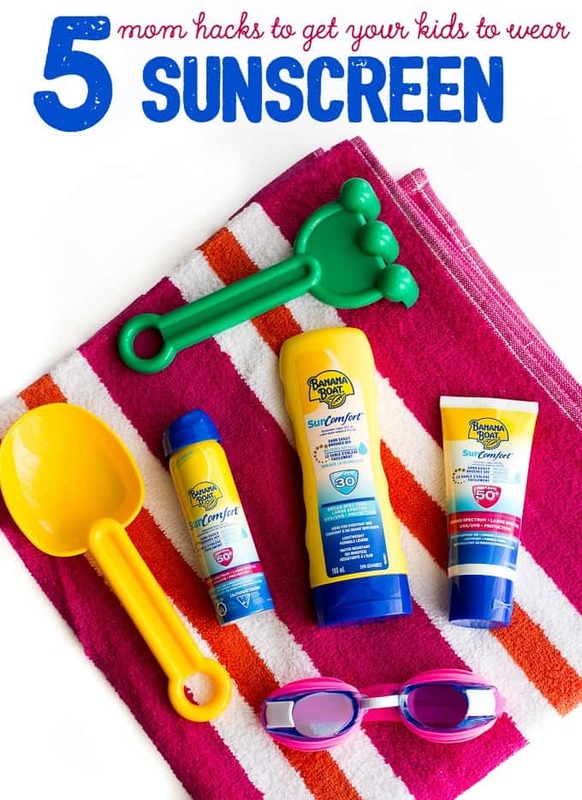 In addition, I’ll be featuring some new Banana Boat SunComfort sunscreen products that are must-haves this summer. 1. Make it a routine. It’s no secret that kids thrive on routine. We do it with brushing teeth and bath time so it makes sense to develop a routine for applying sunscreen any time your child will be spending the day outdoors. If you stick to it, kids will learn to expect that they can’t go outside until they are wearing sunscreen. 2. Let your older children apply sunscreen themselves. My oldest daughter doesn’t need my help anymore and keeps a bottle of sunscreen in her room to apply as needed. Bridget, the younger one, applies it mostly on her own, but I always apply on her back for obvious reasons. She’s been doing it on her own, under my watch, for the past several years and has said she “doesn’t need my help”. Kids like to be independent and this was one easy way to give them some responsibility. 3. Make up a fun name for sunscreen. “Hey kids, time to apply sunscreen” doesn’t sound as exciting as “Hey kids time to put on our superpower sun shell”. Or something like that. Get your kids to come up with ideas – the quirkier the better! 4. Distract them. When all else fails, find a distraction. I used to sit my kids in front of their favourite TV show and get to work while they were focused on something else. It saved me from quite a few meltdowns. Olivia’s favourite show was the Teletubbies and she would be entranced by these strange characters. It made it easy for me to quickly apply sunscreen on her and get out the door. 5. Use a paintbrush. Pick up an inexpensive paint brush at the hardware store and use it solely for applying your kids’ sunscreen. It makes the experience more fun than simply rubbing it in and still gets the job done. Kids think it’s neat to be able to paint themselves and it turns the experience into something to look forward to versus a chore. As for the sunscreen to use, I recommend the Banana Boat SunComfort line. Not only does it offer broad spectrum UVA/UVB protection, but it also helps to prevent sand from sticking to your skin. This means you can stick your feet in the sand as you relax and not have to worry about bringing sand home with you in the car. It simply brushes off thanks to its unique lightweight formula. Another plus is that this line also moisturizes and relieves dryness caused by the sun, chlorine and salt water. I like how it makes my skin feel soft and smooth. If you or your kids will be in the water, note that the Banana Boat SunComfort line is water resistant for up to 80 minutes. I recommend bringing it with you in your bag whenever you are heading outside. 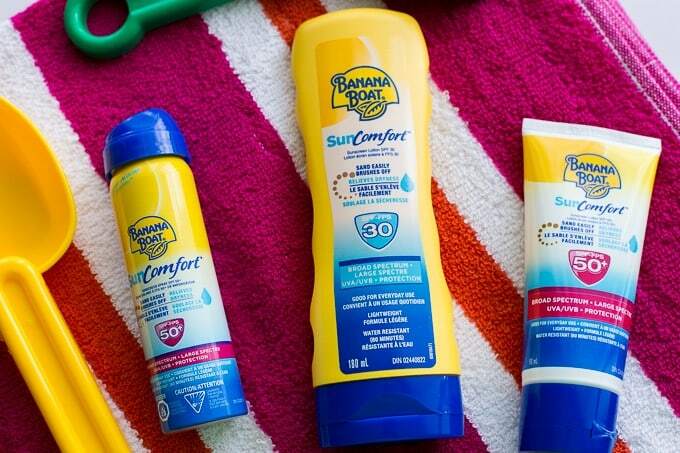 Look for the Banana Boat SunComfort Lotion in SPF 30 (SRP $10.49) and SPF 50+ (SRP $11.49). For the times you are on the go, pick up the travel size lotion in SPF 50+ (SRP $6.99) and continuous spray in SPF 50+ (SRP 3.49). They are small enough to easily fit into your purse so you never leave home unprepared! Do you have any mom hacks that helped you get your kids to wear sunscreen? Connect with Banana Boat Canada on Facebook. I used to tell them they couldn’t got out to play at the beach or wherever until they had it on and that always worked. Surprisingly my girl doesn’t mind sunscreen as long as she gets to help apply. As an E.C.E i love these tips! The Paint Brush one is great! I just had skin cancer removed from my nose in day surgery last October. It’s no joke. Thankyou. These are great ideas for getting your kids to wear sunscreen. I don’t have any tips, but I like the paintbrush idea! As the parent of a child with mild albinism I can say that sunscreen is the most important thing to wear not only during the summer months but all year. Great tips! Nothing really to add, it is usually me being the one to forget to put it on. OOh! I love that paintbrush idea, that is so clever and my kids would totally fall for it. haha. REally it’s about distraction and making things fun, right? Thanks for the tips I love the paint brush and changing the name idea!! I never even thought to use a paint brush to make it fun! Such a great idea! Being in AZ we have to make sure they are covered even for school, so I absolutely appreciate the tips. Ya I would be going for the distraction technique in my house for my son. He doesn’t love it when I apply it, especially to his face & neck, & then I know I’m missing spots. I might entice him with his mp3 player & headphones. I love the ideas with the cool name for sunscreen and the paintbrush application. I wish I had known these tips when my son was small. I will pass these ideas along to people I know with little ones though. I bet they will appreciate them also! Great tips. We always get the grandchildren to put it on before we head out. We love Banana Boat products. If my mom had said to me “Let’s paint on your superpower sun shell!” I would have been on that like stink on a monkey. I really like the idea of using the paint brush from the hardware store. My wife just reminded me that the paintbrush is supposed to be for applying sunscreen, not painting the children blue. I guess that works, too. These are some great tips.I like the paintbrush idea..cute! That sunscreen sounds great. I really have day care to thank for our son being SO accepting of sunscreen. They put it on all year round. Now…if I could only do something about my husband. My daughters know that they need to wear sunscreen outside. They’ll usually ask to wear it when they go outside. We’ve talked about this a lot so that they know it’s important. We use the “You can’t go play until it is on” rule at our house too. It has never been optional so they just expect it. I know some people would disagree with me, but I’ve never put sunscreen on my kids. Most sunscreens have too many chemicals and other nastiness that I don’t want to rub on their skin. Great tips. I have a bad habit of forgetting sunscreen, but with our family’s kids around, I need it on hand! Such great ideas! I chuckled at “Superpower Sun Shell.” That’s too cute, and really brilliant! I don’t have ideas to add, but I do love the paintbrush idea. Using a paintbrush to apply the sunscreen is a fantastic idea. I will have to try that tomorrow. My kids never want to sit still for me to put it on. My kids used to hate letting me put sunscreen on them. I started to buy the spray on kind and it made it fun for them. My kids are used to having to put on sunscreen. We make it a game to get them to cooperate. These are great ideas. I particularly like the ideas about using a paintbrush. It will get the job done and keep everyone from being miserable during the experience. Making it a routine is so important! That way it is something that they don’t question. Sunscreen is so important that starting off young with making it a part of their daily routine is great! Clever tips! In their early age we should always keep wear their sunblock to protect their sensitive skin. Love the paintbrush idea, and the name giving! Thank you fort this post! Great ideas.